Black shale is widely distributed in southern and western China. The swelling and breakdown characteristics of black shale are important physicomechanical properties in engineering activities. Aqueous solutions with different compositions exert various influences on the swelling characteristic of black shale because of the complexity of its composition. Soils derived from black shale are most commonly developed on black shales with bedded horizons that generally have cutting and weathering profiles. 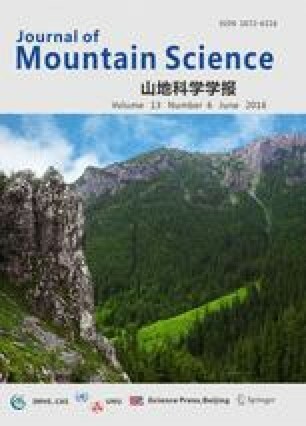 This paper reports an axial free swelling study for soils derived from black shales and developed in the Lower Cambrian black shales in Chengkou County, Chongqing Municipality, Southwest China. To discuss the swelling characteristics of black shale under the influence of cations, an axial free swelling test was conducted on black shale samples while considering the initial water content, weathering stage of black shale, and different cationic solutions with various concentrations. Results showed that the swelling deformation curve of black shale could be divided into three phases: acceleration, deceleration, and stability. The axial swelling ratio eventually decreased with increasing water content, and the axial free swelling rate changed with the free expansion model of the exponential relationship. Under a constant initial water content, the axial swelling rate increased with the intensity of black shale weathering in the same immersion solution. When different types of immersion solutions were used, the cationic price was high and the axial swelling rate increased with rising cation valence. The changes in the swelling ratio were significant at a valence of one or two. The results of this study provide further understanding of the engineering geological characteristics of black shale and the geological hazards caused by the swelling characteristics of black shale.